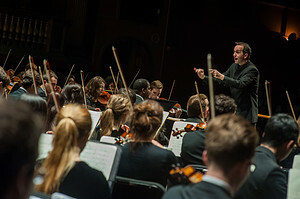 Christopher James Lees conducts "Gold Medal Soloists"
The University of North Carolina School of the Arts Symphony Orchestra takes the stage this month to highlight the individual talent that comprises the ensemble. The “Gold Medal Soloists” concert features the winners of the 2017 UNCSA Concerto Competitions. The performance will take place at 7:30 p.m. on Saturday, March 31 at the Stevens Center, 405 West Fourth St. in downtown Winston-Salem. Tickets are $18 regular and $15 students with valid ID, and are available online or by calling the box office at 336-721-1945. The repertoire includes Rimsky-Korsakov’s “Russian Easter Overture,” “Concerto for Alto Saxophone & Orchestra” by Henri Tomasi and Tchaikovsky’s Piano Concerto No. 1. Andrew Hasher will perform Henri Tomasi’s “Concerto for Alto Saxophone & Orchestra” with the UNCSA Symphony Orchestra. UNCSA holds two Concerto Competitions each year—one in April for students at any level within the school, and one in October for graduating students, both judged by guest adjudicators. The winners earn the opportunity to perform their competition piece with either the UNCSA Symphony Orchestra or Wind Ensemble. The stars of the Gold Medal concert are college senior Andrew Hasher, saxophone, who won the spring competition, and high school senior Jacob Wang, piano, who won the fall competition. Hasher will join the orchestra to perform Henri Tomasi’s “Concerto for Alto Saxophone & Orchestra,” which Lees describes as “equal parts haunting and driving, and the musical language used in is down-right mystical. Hasher says Tomasi’s piece is “a colorful, technical, and extremely emotional work. Wang will play Tchaikovsky’s iconic and challenging Piano Concerto No. 1. The final piece on the program is Rimsky-Korsakov’s “Russian Easter Overture.” Although it doesn’t feature a main soloist, the work still allows individual musicians to shine.